Is it possible to create menu items with different subdomains and how do I create them? I worked with the CMS "typo3" previously and there was no problem in doing this, but a long search through the internet didn't help me with this problem. EDIT: Note that a.example.com and b.example.com are on the same Joomla installation, so I'd like to make a new "Single Article" with a subdomain. I haven't try it, but Artio JoomSef claims to provide such functionality. 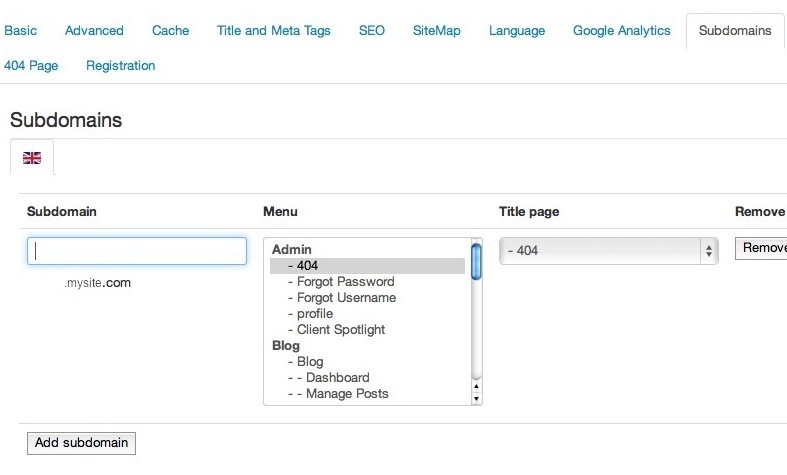 You can specify sections of your website to be used for different subdomains. It might be worthy to check it. If you are looking for more complex configurations, Joomla MultiSites extensions allows you to run many joomla sites, from one installation, with various configurations. A link to this JED section is provided in another answer here. menu-item parameters > menu item type > system links > choose "External URL"
Then in the Link field you can type the URL of your sub domains. You can't really do this with native Joomla, but you can use a extension that try to help you doing this. If you don't want to use an external component for this, then you can create an external URL in your menu pointing to a.example.com and use your .htaccess file to get content from your site's existing link. Suppose, if your user visits this URL a.example.com/user/sd, then the content will be of example.com/user/sd without changing actual URL on browser. Go with this method only if you are well familiar with .htaccess file usage and ok with manual editing. This is useful if you don't want to use entire new extension for just few urls. I know this is a bit old this question but I was wondering the same thing and here is the solution I came up with if you change the templates index.php file with a bit of extra code you could create multiple module positions based on the subdomain, and then you assign the correct menu item to the relevant subdomain. In the above example the line starting $sub is what you'd need to customise for your own website, at present the example creates a space for a navigation module depending on the subdomain - this was created for a site with two sub domains and a general domain and so it creates three navigation positions for each subdomain - navigationhome navigationplus and navigationgroup. to find the subdomain I've used the function in_array. I could have used a switch statement on $dom to find the subdomain but this wouldn't work if someone typed something like www.plus.mysite.co.uk as www would be in $dom... e.g. the initial explode uses str_replace to replace // with . this is so that the initial http / https ends up in it's own array ($dom will always contain the http/https which I suppose could be used further if you wanted to show different sites depending on the protocol loaded, if that wasn't there then is someone put in something like http://plus.mysite.co.uk then the first array would contain http://plus and in_array would return no match. It's unlikely you'd be using these in this manner but it's worth noting. Yes, you can create that menu structure in Joomla. In general the menu items point to a view in a component specifying the item and other parameters. When you install Joomla with the learning demo data, you'll notice two completely different sample sites, including the learning demo, teaching you everything about Joomla. Not the answer you're looking for? Browse other questions tagged joomla-2.5 menu-item or ask your own question.